I was a rambunctious and energetic boy, and consequentially, didn’t want to sit still in church. One Sunday a family friend watched my mother deal with me as I became irreverent and disruptive in church. Each time I began to get noisy, irreverent, or disruptive, she would simply open her purse and show me something. Every time I looked inside her purse, I settled down and behaved as I should. The family friend saw my mother repeat this process several times during the church meeting. Curious, he approached her at the end of the meeting and asked her what she had in the purse. My mother smiled and opened her purse. There, on top of her wallet, keys, and various other personal items, was a small switch from the forsythia bush in front of our house. My mother understood deterrence in its simplest and most effective form. My parents were good parents, in fact, exceptional parents considering that they raised ten (mostly normal and functional) children. (We are all normal and functional most of the time.) 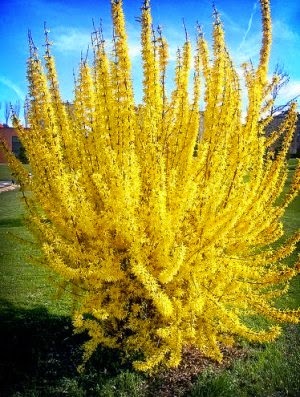 Our house had a large yellow forsythia bush right outside the front door, and when we misbehaved, we had to march outside and pick a switch from that bush that would then be used as the instrument of our punishment. As one who went to the bush several times, I tried various sizes in an effort to find the size that wouldn’t hurt. I can tell you from personal experience that size did not matter. They all hurt. Now you might think such punishment harsh, but in reality they were in good company. The Bible explains that Jesus cleansed the temple with a “scourge of small chords” (a whip) and overturned the moneychanger’s tables. In one of the rare displays of physicality, Christ reinforced the law with physical force and moral momentum. By the way, He cleansed the temple a second time right before he was crucified. It seems that Christ himself was passionate about obedience and was not afraid to use physical restraint to extract it. My parents were in good company. Don’t misunderstand me, they didn’t beat me or abuse me. I think they chose the switch because although it stung, it didn’t do any permanent damage. It also allowed them a bit of distance since they could punish me without striking me with their own hands. Afterwards they would always wrap me in their arms and let me know that they loved me. It was discipline with purpose, not just punishment for punishment’s sake. With my own children, my wife and I took a slightly different route. We used restrictions and “time outs” more often than the physical punishment. (Maybe because we didn’t have a forsythia bush.) We set standards of behavior that we expected to be followed. When a child chose not to follow that standard of behavior, unfortunate consequences followed. Corporal punishment was less prevalent than when I was raised. We also tried to discipline with purpose, not just punish for punishment’s sake. I will be the first to admit that I lost it a few times and either said or did inappropriate things that I later regretted. Unlike Christ, who remained in control of his emotions and maintained the moral high ground as he used physical force, I sometimes punished in the strong emotion of the moment. I don’t admit to being guilty of abuse, but of punishing in anger instead of love, or of simply gratifying my bruised ego instead of trying to teach. Of all my sins, those moments of poor parenting still bring me the most pain. I don’t know all the facts surrounding the Adrian Peterson child abuse case (Or any of the other cases in the media right now). I don’t know if his punishment exceeded what would be considered reasonable. But I can imagine how difficult it must be for both the parent and child to have their relationship judged in the court of public opinion. It will be a tremendous wedge in their relationship for years to come, no matter what the outcome. My heart goes out to the both the father and the son. Ironically, Peterson lost another son (from another relationship) to abuse at the hands of another man just a few short months ago. He is no stranger to the results of abuse. Parenting takes courage. Sometimes that means the courage to discipline. Sometimes that means the courage to swallow your pride and ego. Sometimes that means the courage to allow your child to feel the pain of their actions as artificial or very real consequences. Sometimes it means having the courage to show mercy and love. It is never easy to know what type of courage is needed day to day. Parenting also takes a great deal of love. Sometimes that love comes in the form of patience. Sometimes that love manifests itself as restraint. Sometimes that love is shown as much by NOT extracting punishment as it is by punishing. Love doesn’t leave any permanent damage, even when that love is shown through discipline. Just as Christ was passionate enough to use physical force in the extreme cases, He also admonished that anyone guilty of abusing children would be better off at the bottom of the ocean with a millstone around his neck. It seems that even He was intolerant of domestic abuse. I have no permanent marks on my legs from all those forsythia switches. I hope my children bear no permanent marks (emotional or physical) from the punishments I meted out. I do hope, however, that the discipline they felt at home will be a deterrent that will keep them from unruly, and rambunctious behavior as an adult. I hope that it will deter them from illegal or immoral behavior. Without proper discipline at home, a society will soon find itself unraveling at the seams and plunging into utter chaos. However, I certainly hope that the threat of jail time, loss of income, and becoming a pariah of society are successful deterrents to those who would abuse spouse or children. My mother wouldn’t stand for bad behavior. We, as a society, shouldn’t stand for it either.